In today’s competitive business environment, cutting edge technology is vital. Whether communicating with customers, collaborating between multiple locations or providing consistently excellent service, TechPath can help you achieve more. An independent assessment that gets your systems operating at peak efficiency. Want the ultimate IT environment? 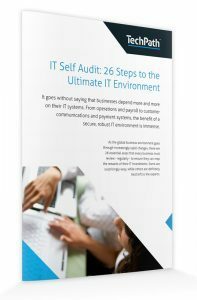 Access our whitepaper to find out how you can achieve more. “TechPath has been with us since our inception as a company over 10 years ago. In that time we have grown from one small office with two computers and a printer to a national business with branches around Australia and close to 75 users. TechPath has grown with us in that time to become a trusted business partner. We enjoy strongly performing and reliable IT systems that enable us to concentrate on running the business without worrying about the demands of day to day IT management. We would recommend TechPath as a competent and trustworthy IT service provider anytime”. “The TechPath Cloud PBX is excellent value for money. It has been a seamless transition and our staff are enjoying their direct lines with messages going to email. The ability to automate out of office messages on a timetable is an efficient and professional way to operate. We are very happy with the product”. “We had difficulty getting our existing provider to assist with business internet and telephone services when we moved premises. TechPath not only provided a cost effective and reliable internet solution but were also able to provide a VOIP solution and backup internet service to integrate with our existing phone system”. “Recently we replaced an outdated server, ADSL connection and installed a much faster cloud based solution to store all our company documents, photos and files. We can now access our files from any computer, allowing flexibility for our staff to work in different locations. We are also experiencing much faster upload and download speeds throughout the entire office enhancing our experience in Outlook, Office 365, Windows 10 and our advertising and accounting software. The TechPath team are friendly and reliable and made our migration a smooth transition”.